The Russian Navy's Poseidon Intercontinental Nuclear-Powered Nuclear-Armed Autonomous Torpedo will run much deeper and faster than submarines. Therefore new weapon systems will be required to counter it. This article explores some of the near-future systems which may be developed by NATO. It is not clear why the Poseidon (Посейдон) torpedo (NATO: KANYON, aka 'Status-6' (Статус-6), and 'Skif' (Скиф) for seabed launched variant) has been developed. The most straightforward explanation is that it is a hedge against future improvements in missile defense diminishing the reliability of ICBMs (inter-continental ballistic missiles). It is also possible that arms limitation treaty rules played a part since it is so novel that it is not covered by existing treaties except in the most general terms of warhead count (some limitations on placement due to Seabed Arms Control Treaty 1972 also accepted). Another possibility is that the weapon is completely independent of satellites for navigation, thus increasing reliability on a second strike scenario where some or all Russian satellites may be lost. Stealth is unlikely to be a motivating factor however. Poseidon is not a quiet unmanned submarine which could sneak into enemy ports to inflict a first strike attack without warning. Although it can be described as 'drone' or autonomous underwater vehicle (AUV), it is a weapon. Its operating modes and route planning will likely be simple (read reliable) and relatively direct, relying on speed and depth for survival. This unique multipurpose weapon spans both the strategic deterrent and tactical nuclear domains, and can be thought of as an exceptionally long-range torpedo with a nuclear warhead which can target coastal cities, and reportedly also moving targets. The tactical nuclear use, which is emphasized by Russia in promotional videos, makes countering the weapon directly more pressing. The use of strategic weapons is currently deterred by the threat of nuclear retaliation, in a strategy called Mutually Assured Destruction (MAD). Therefore, a direct counter is not required and can be argued to be counter-productive because it creates a situation where one side has an advantage. This is an argument which has frequently been made against missile defense; a point which may have been demonstrated by the creation of Poseidon itself to offset the development of missile defenses by NATO. So, if Poseidon were purely a strategic weapon, there would be an argument that it does not need a direct counter. Instead the indirect counter of the certainty retaliatory nuclear annihilation would be enough. However, tactical nuclear weapons are intended to be used in conflicts which fall short of the use of strategic nuclear weapons against civilian targets. Therefore some uses of Poseidon cannot be guaranteed to be deterred by MAD, and instead needs a direct counter to mitigate it. The two countries most likely to see the need to develop direct counters are the US and UK. Both have carrier battle groups which would be prime targets for Poseidon in its tactical mode, and both operate nuclear powered attack submarines (SSNs) whose job is to directly counter Russian strategic submarines (SSBNs, SSGNs). In the future Poseidon’s host submarines will be added to the targt list. 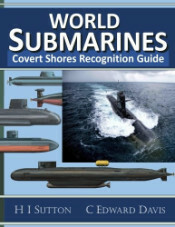 Since the 1960s western hunter-killer submarines have been designed to trail Russian submarines close enough to engage them immediately fighting broke out, taking them out of the equation before they can launch their nuclear weapons. This approach still has some validity but is challenged by the increasing stealth of Russian submarines and shortage of NATO submarines. Persistent trailing of Russian submarines by unmanned surface systems (e.g. Anti-Submarine Warfare Continuous Trail Unmanned Vessel (ACTUV)) could also provide quick-kill capability before launch. However, the autonomous nature of the Poseidon weapon means that a way of destroying the weapon after launch should be found even if some or all of the launch platform submarines are destroyed during the launch window. In addition to strategically positioned fixed hydrophone arrays, navies will need a way of rapidly deploying sensor networks across the likely path of Poseidon torpedoes. Ideally the sensor networks would include their own Effectors (e.g. torpedo armed mines) to minimize the delay from detection to neutralization, since the targets will be moving much faster than traditional submarine targets. 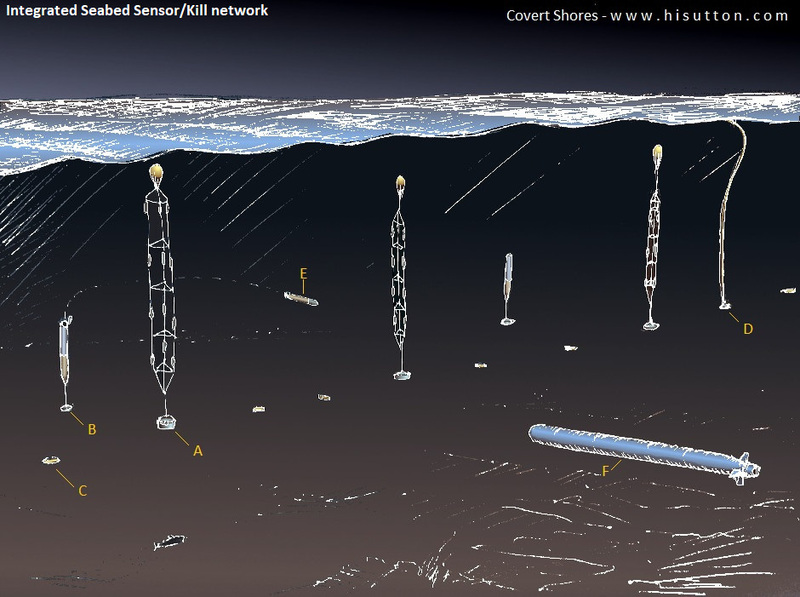 A) moored hydrophone array through water column (generic representation). B) moored propelled mine. C) Seatooth node. D) surface communication node. E) torpedo launched against target. F) incoming Poseidon intercontinental autonomous torpedo. The sensor networks would need to be laid in front of the incoming Poseidon torpedo since the Effectors would likely be too slow to catch Poseidon in a tail-chase scenario. Current reports indicate that Poseidon can run at 70 knots, which is near the limit for regular torpedo-like objects. To achieve a rapid enough deployment the sensor networks would have to be laid by aircraft. Primarily this means large maritime patrol aircraft (MPAs) and shipborne anti-submarine helicopters. Potentially ways of deploying the sensor network in the manner of sub-munitions from a cruise missile could also be explored, allowing fast jets to lay modest sensor networks at great speed and stand-off range, potentially even in enemy controlled airspace. Normally aircraft employ sonar-buoys which float and communicate back to the aircraft or shore via radio. However the great operating depth of Poseidon means that seabed sensor networks make more sense, and would have the added advantage that they do not drift apart, thus increasing the lifetime of the network, potentially to months or even years. The challenge of laying current generations of seabed sensor networks from aircraft is that the nodes are connected together by cables. These add weight, drag and would be prone to breaking as the network is being laid. This can be overcome by developments in undersea wireless communications. 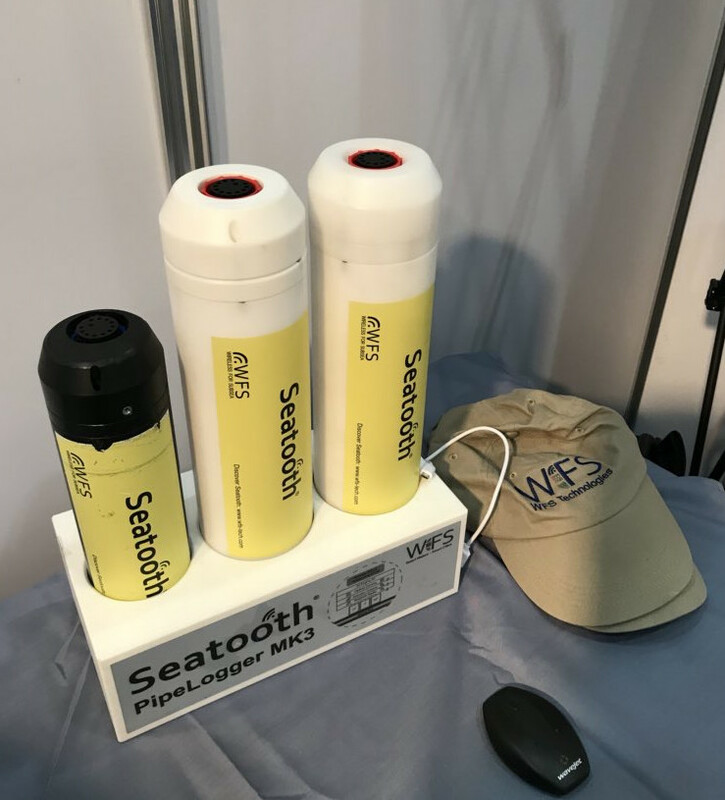 Seatooth from WFS can operate in regular acoustic communication mode, but can also operate in radio frequencies for shorter ranged low-intercept and higher frequency data transfer. At very short ranges they can use optical communications for extremely high data transfer speeds. All three modes are incorporated into a single Seatooth node, which also has its own processing capability. Effectors such as moored propelled mines could be integrated into the sensor network using the Seatooth wireless technology. The mine nodes would primarily be used to launch next-generation torpedoes, but would have standard Seatooth communications and data processing capabilities. The local processing of target information, distributed throughout the network, would allow better target discernment than previous systems, reducing false alarms. Unlike previous generations of moored propelled mines (e.g. Mk.60 CAPTOR), they would be networked together. They would be able to receive mid-course updates as they pass other Seatooth nodes, and have a much greater range than previous torpedoes of a similar size and application. With optimal positioning behind a barrier of sensors laid across the path of the incoming Poseidon torpedo, it would be possible to optimally space the Effectors along the network, achieving much higher degrees of efficiency than previous moored propelled mines. The network would also communicate with shore via a floating aerial which would allow other assets to be primed to engage the Poseidon torpedo. 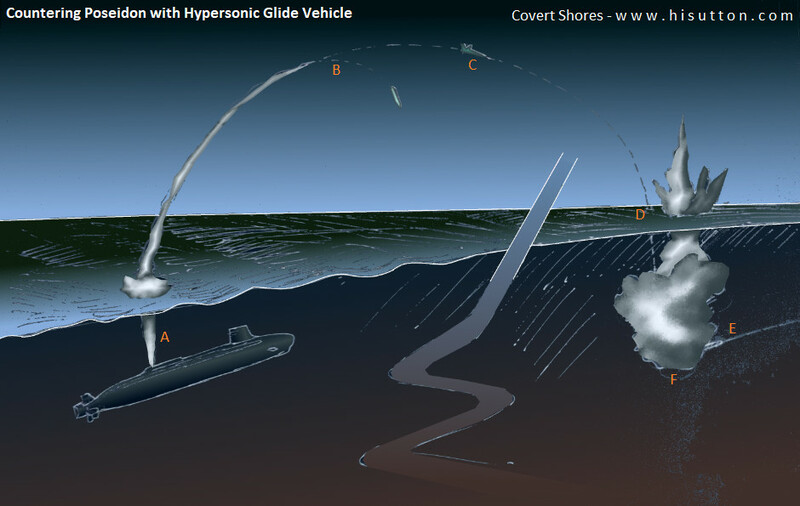 The large diameter vertical launch tubes found on some US Navy attack submarines (SSN/SSGN) could be used to launch long range hypersonic glide vehicles with sub-sea payloads. The vehicle could be capable of speeds of Mach 5 or more. The payload could be next-generation lightweight torpedo or nuclear depth charge similar to the retired SubROC weapon. The short flight time and long range of this type of system would allow kills far outside realistic ranges for torpedoes and allow submarines operating in the North-Atlantic to react to Poseidon launches detected in the artic region, hitting the target while it is still reasonably near to the sensor which detected it. Alternatives to a glide vehicle could include scramjet powered vehicles and rockets. The US Navy is reported to be involved in several relevant programs, while China is developing the DF-ZF boost glide weapon, and Russia is fielding the Objekt 4202 Avangard Mach 20 hypersonic weapon. The large diameter boost rocket of any likely system will preclude the UK from fielding the weapon from its attack submarines however. A) Virginia Class SSN launches weapon from payload module (VPM). B) boost phase separation. C) glide phase. D) sub-sea payload deployed over target area. 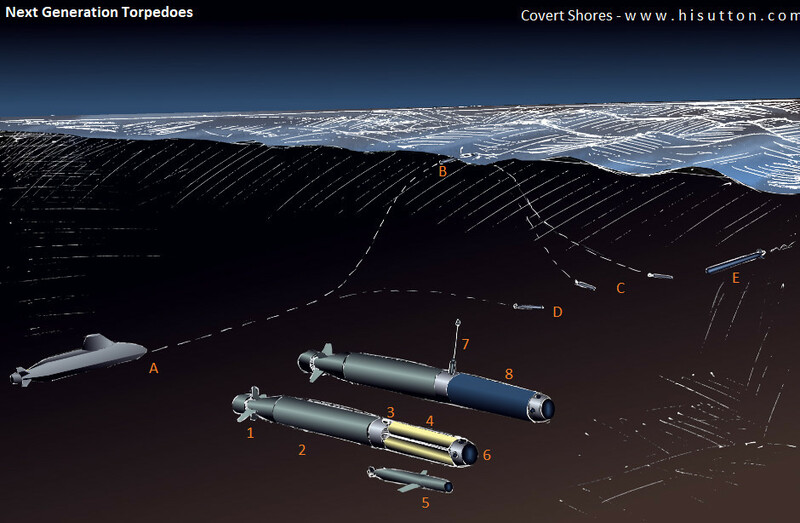 E) path of Poseidon intercontinental autonomous torpedo. F) detonation of payload. 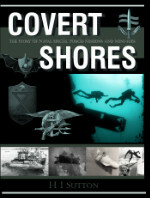 The current families of US Navy and Royal Navy torpedoes were developed to counter fast deep-diving Russian submarines. While they are highly capable, the even greater combination of speed and depth of Poseidon means that new weapons will need to be developed. These are likely to be characterized by increases in range and autonomy, blurring the distinction with Unmanned Underwater Vehicles (UUVs). They will need to come in both heavyweight (21” / 533mm) and lightweight varieties. One likely development is that a heavyweight torpedo could itself carry several lightweight torpedoes or UUVs to increase its chances of successfully neutralizing the target. The most lightweight weapons would be as small as possible, while still having useful range, speed and warhead. To fit inside a 21” (533mm) torpedo, they would need to be no greater than 10.5” (267mm) to carry two, or 9.5” (228mm) to carry three. This is smaller than current NATO lightweight torpedoes. Thus there might be three distinct torpedoes; 1) heavyweight for submarine use, 2) standard lightweight for helicopters and shipboard use, and 3) 9.5” (228mm) narrow body for carriage by heavyweight torpedoes. A) submarine launches torpedo. B) surface mode for loiter and communication. C) torpedo(s) diving to target. D) torpedo taking direct route to target zone. E) incoming Poseidon intercontinental autonomous torpedo. 1) Propulsion module with electric motor. 2) large battery for all-electric propulsion. 3) compact guidance, communication and control module. 4) multi-weapon payload module with three or more sub-weapons (lightweight torpedoes or sensor unmanned underwater vehicle. 5) lightweight torpedo with some features of unmanned underwater vehicles (UUVs). 6) Seeker and fusing module. 7) retractable mast for surface communication. 8) large single warhead module.